Axe deodorant (a.k.a. 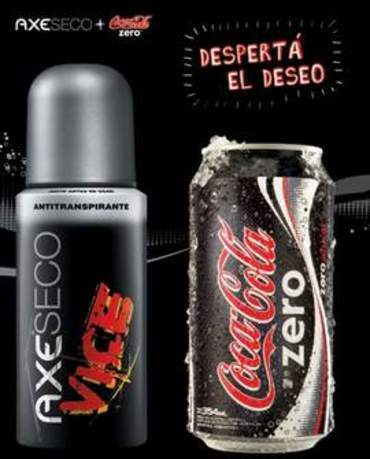 Lynx in many parts of the world) and Coke Zero have joined in a promotional partnership. This sort of thing is not uncommon in Argentina (more on that to come). It can be an effective way of achieving product sampling with the added benefit of association with a cool brand. Perhaps this will help Coke Zero stand out above Pepsi Max as the two are advertising prolifically at the moment for essentially the same audience. 70,000 packs of the two products will be on sale throughout the country in supermarkets and farmacies. (I'm guessing it's a free coke with a bottle of Axe). There is a clear overlap between the two target audiences but I wonder how many of Axe's consumers do their own shopping. Here's an article about it in Spanish.